Historically, a four year bachelor’s degree from a school as prestigious as the University of Maryland was a qualification for future employment in itself. Unfortunately, times have changed, leaving many students scrambling to find ways to stand out to employers. According to the U.S. Department of Education, 69 percent of today’s high school graduates enroll in college directly after graduating, a six percent increase from the year 2000. As more young people obtain undergraduate degrees, applicant pools for internships and other student-geared positions become larger, which raises the bar for expected qualifications beyond what is typically taught in the traditional college classroom. Basically, if you’ve ever applied for a seemingly entry-level job or internship to find that proficiency in an unknown software or one to three years of experience are required, you’re not alone. The National Association of Colleges and Employers’ most recent annual survey reported that 95 percent of employers look for previous experience in college-aged candidates. Luckily, Skillshare, an online learning community based in New York, can help provide you with that experience to make your application stand out. The platform offers over 18,000 online classes on a multitude of topics ranging from iMovie and Photoshop to HTML and Microsoft Excel and almost everything in between. Skillshare’s mission is to “make the new economy an open meritocracy," by fostering an environment where “the skills and expertise needed to succeed are available for anyone willing to learn them,” according to Michael Karnjanaprakorn, one of Skillshare’s co-founders. For a monthly fee ranging between eight and 15 dollars, students have the opportunity to take as many courses as they want on any number of subjects, similar to the subscription model for Netflix or Spotify. If you sign up through this link, you can get your first two months of Skillshare Premium for only 99 cents! Student reviews from various websites mention the breadth of content available on the site. “I'm learning new skills in software animation, music recording, storyboarding, anthropology, and cooking, and I'm just getting started on my second month,” one user said. For Valerie Jauma, Skillshare provided the resources to transition into her dream career. After graduating from The University of Texas at Austin in 2003, Jauma accepted a job in the advertising industry as an account executive, and stayed in this role for eight years. While she always had a passion for technical illustration, her eight year hiatus from practicing it left her overwhelmed by the thought of catching up with all of the software changes since. "Starting over is scary, but it only gets scarier the older you get,” she said. Once she officially decided she wanted to enter the graphic design industry, Jauma took courses on Adobe Photoshop, Illustrator and other similar programs on Skillshare. Not only did these courses provide her with the technical foundation to enter her new career, but her instructors also inspired her to develop her own unique style of design. “I knew I was on the right path when I started to feel excited to wake up in the morning and dive right back into whatever I had been studying or working on the day before,” Jauma recalled. After six months of sharpening up on her skills and developing a portfolio of her work, Jauma quit her account executive job and accepted an illustrator position that “challenges and excites [her] every single day." One key reason Juama and so many others have had such success on Skillshare compared to other digital learning platforms is because Skillshare fosters the same sense of community that accompanies enrolling in face-to-face courses. Each class has a ‘Community’ tab, allowing members to ask questions and receive real-time feedback from their peers and their instructor. For those who are looking to build up a portfolio of their work, all Skillshare courses also come with an optional project that allows students to showcase the skills they learned. These projects are then featured on the user’s Skillshare profile for the rest of the community to see. They can also be exported and utilized on a personal website or as a work sample for a job application. 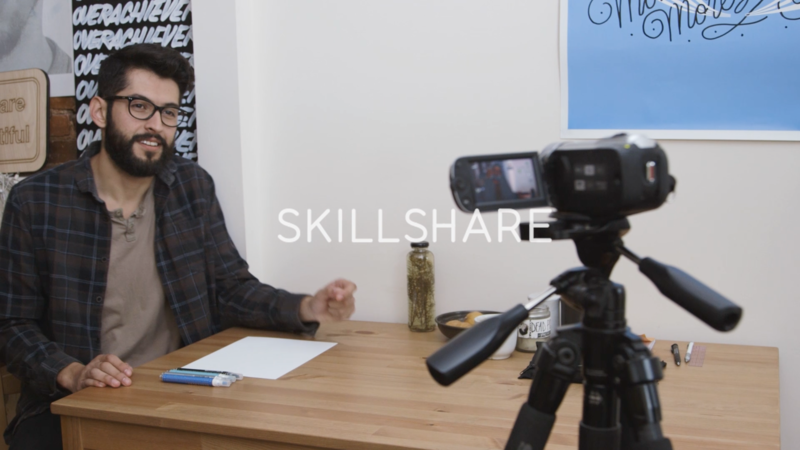 So if you’re ready to expand your skillset on your own schedule, Skillshare might just be for you. Get your first two months of Premium membership for only 99 cents here, or visit www.skillshare.com for more information.